On March 14, 2019, in Nairobi (Kenya), the first regional edition of the One Planet Summit sought to build momentum ahead of the UN Secretary-General’s 2019 Climate Summit with new commitments, initiatives and coalitions, such as the Global Alliance for Smart Cities in Africa, to develop renewable energy and protect biodiversity in Africa. Convened by Kenyan President Uhuru Kenyatta, French President Emmanuel Macron, Interim WBG President Kristalina Georgieva and UN Deputy Secretary-General Amina Mohammed, the One Planet Summit in Nairobi highlighted the unique role of Africa as a global partner facing both challenges and opportunities from climate disruptions and ecosystem resilience. With a focus on renewable energy access and the protection of African ecosystems, this first regional edition of the One Planet Summit brought together representatives from government, the private sector, civil society, financial institutions and academia to showcase concrete achievements and successes, and to spark new coalitions. A series of new commitments – the Africa Pledge – and a call for action – the Nairobi Call for Action on the conservation and preservation of forests in Africa – were made by the participants. 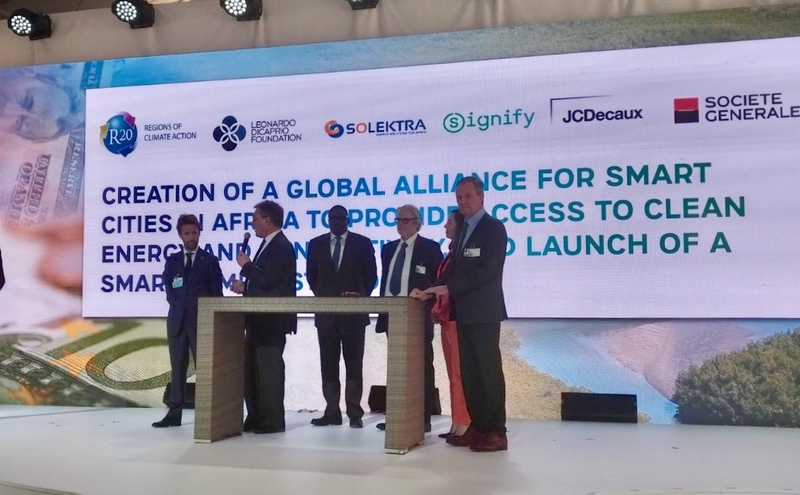 Amongst the many commitments of the Africa Pledge, R20, together with the Leonardo DiCaprio Foundation, Africa Development Solutions Group (ADS), JCDecaux, Signify and Société Générale, announced the creation of a Global Alliance for Smart Cities in Africa (GASCA) to provide access to clean energy and connectivity, and launch of a smart lamppost program. the Alliance was introduced during the high-level session by Samba Bathily, founder of Solektra International and ADS. In his intervention, Samba Bathily highlighted the need for integrated solutions, such as GASCA, to promote breakthrough technologies and business model throughout Africa. “The only way to scale-up renewable energy in Africa is through a multistakeholder approach and innovative financing” he said, “which is why we are announcing the creation of GASCA today”. The African Development Bank, who will commit at least US$25 billion from its own resources towards climate finance for the period 2020 –2025. 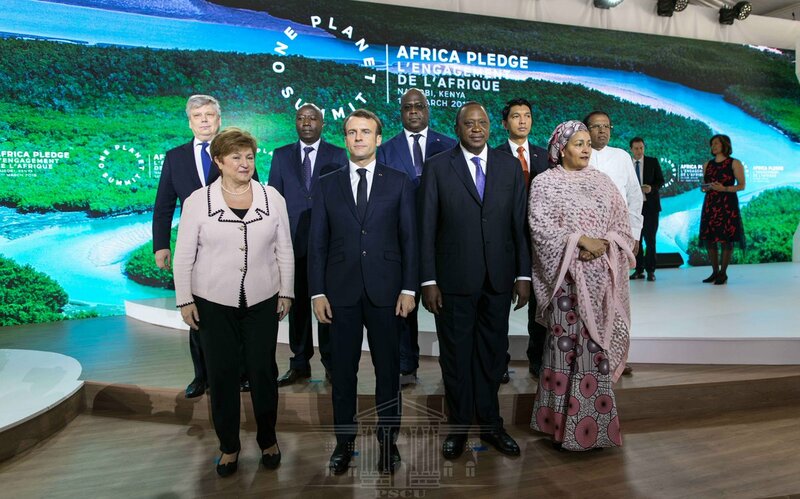 Through the Africa Financial Alliance on Climate Change (AFAC), The African Development Bank will also support African financial institutions to align financial flows with the Paris Agreement. The Agence Française de Développement (AFD) who will launch a Biodiversity Facility (10M€) to support 16 countries develop their national biodiversity strategies in collaboration with WWF and IUCN. Sweden, who, through the Nordic Environment Finance Corporation and Swedish International Development Cooperation announced it will expend off-grid electricity solutions in sub-Saharan African countries by social impact procurement. In his closing address, French President, Emmanuel Macron, stressed that the Africa Pledge is not only about governments mobilizing, but also about public-private investors, businesses, NGOs and the civil society moving forward with them. He highlighted the importance of decentralized cooperation and how R20, through multistakeholder partnerships and innovative finance, supports African local governments in building concrete solutions. “Everywhere things are moving forward, and our responsibility is to highlight and help accelerate these solutions”, he concluded.